Manchester United's interim manager Ole Gunnar Solskjaer has highlighted that the club don't have any plans of strengthening the squad during the current transfer window. The Red Devils have gone through a difficult campaign where they have found themselves defensively vulnerable and this has spread the speculation that they may pursue at least one central defender this month. 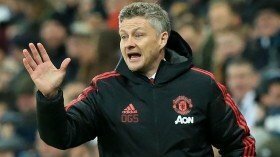 However, speaking in a news conference, Solskjaer has said that he does not expect to recruit anyone, though the hierarchy may have other plans in mind for the current window. "I don't expect anyone to come in but, obviously, if the club have targeted and identified a few and I think they might fit here, I'll give my thumbs up, but it's not just my decision," he said via The Mirror. United picked up their fifth successive win on the bounce under Solskjaer after they secured a comfortable 2-0 triumph over Reading in the third round of the FA Cup on Saturday.